Summer is winding down, and those of you in cold climates are probably counting how many more days you’ll be able to enjoy your outdoor space before the cold sets in. It’s always at this time of year, too, that you look around and take stock, thinking of what you could do next year to take that patio or backyard to the next level. But hey, why wait? Right now is when your ideas and inspiration are fresh. And don’t say you don’t have the time: We’ve rounded up four blogger-tested projects you can pull off in a weekend—or even a frenzied afternoon—that will bring major style to your backyard. Want a water feature but don’t feel like taking a month out of your life to dig a hole and arrange shiny, attractive rocks in a perfect formation? This is much easier—and it comes with a metric ton of rustic charm. 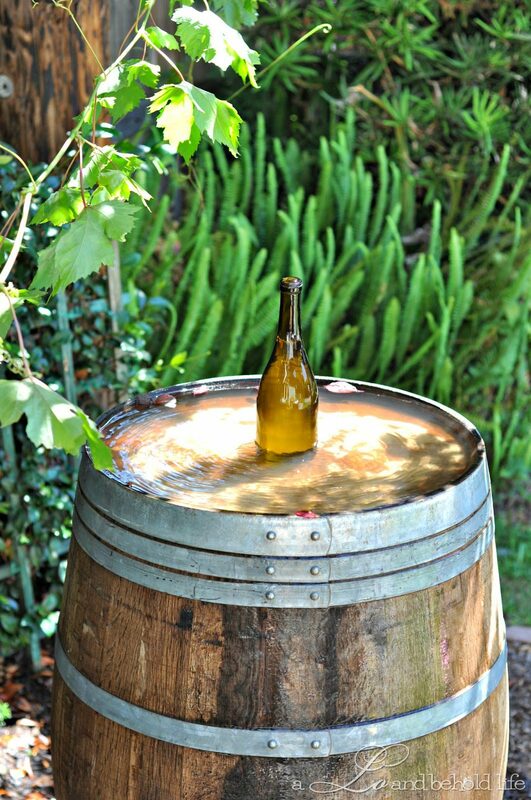 Blogger Lo Savarese developed the idea for this repurposed wine barrel fountain after visiting wine country with her husband. They “loved all the various ways each vineyard used wine barrels around the grounds,” she says. Savarese had always dreamed of a backyard water feature, but she found ornate or modern versions lacking. The project is relatively simple—the hardest part is removing the barrel head, which Savarese and her husband repurposed into a lazy Susan. Cool! The full instructions can be found on HGTV or Savarese’s blog. Blogger Alison Allen loves cabins and the “cabin lifestyle.” The key to that life? A fire pit, a hub of evening and late-night gatherings and an absolute necessity for making s’mores. She and her husband purchased on off-the-shelf fire pit and needed a place for it to live. Plopped on the lawn, it singed the grass, so they built a brick surrounding, which provided increased safety and an attractive home for the fire pit. Allen picked a spot far from their home and the neighbors. “Fires can get a little stinky and the volume of the fire pit party can get a little loud,” she writes in her blog. 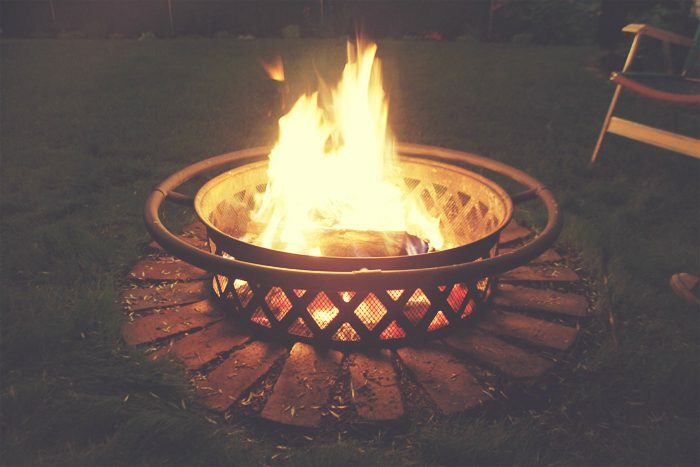 After shoveling out a circular depression, place a rim of bricks in a circular pattern and set your fire pit inside. Voilà: a place for guests to gather! “Any time we have a backyard party, the seats around the fire pit are the first ones to go, whether the fire is lit or not,” Allen tells us. What backyard is complete without a shady hiding spot? If your property isn’t blessed with enormous trees, you don’t have to be subject to the sun forever. Instead, build your own tent—kids will love it. No, we’re not talking about a camping tent. We mean a simple fabric-covered A-frame, easily folded for storage during rain. 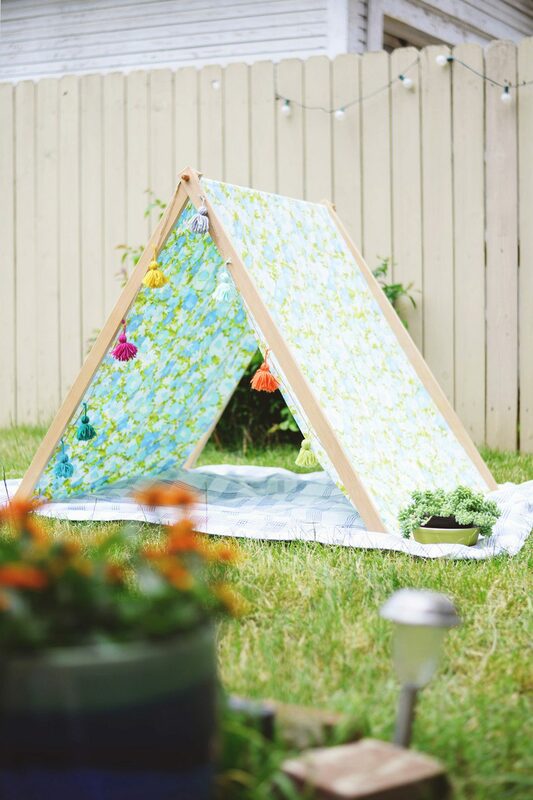 Blogger Chelsea Mohrman developed this DIY project because she “wanted to make something budget-friendly that could keep my son out of the hot son while we hang outside,” she says. Using materials she already had on hand, she came up with this simple fold-up frame. While you can choose fabric, Mohrman and her husband used a king-size sheet folded in half, fitting wooden boards with copper pipes to make the center joints. Aspiring gardeners lacking swaths of soil: Fret not. Following this DIY tutorial from graphic designer Ciera Holzenthal will provide enough spots for all your favorite plants to grow—without taking up your whole backyard. “My backyard was feeling very bland,” Holzenthal says. Her fiance, an avid pizza chef, saved leftover tomato sauce cans. 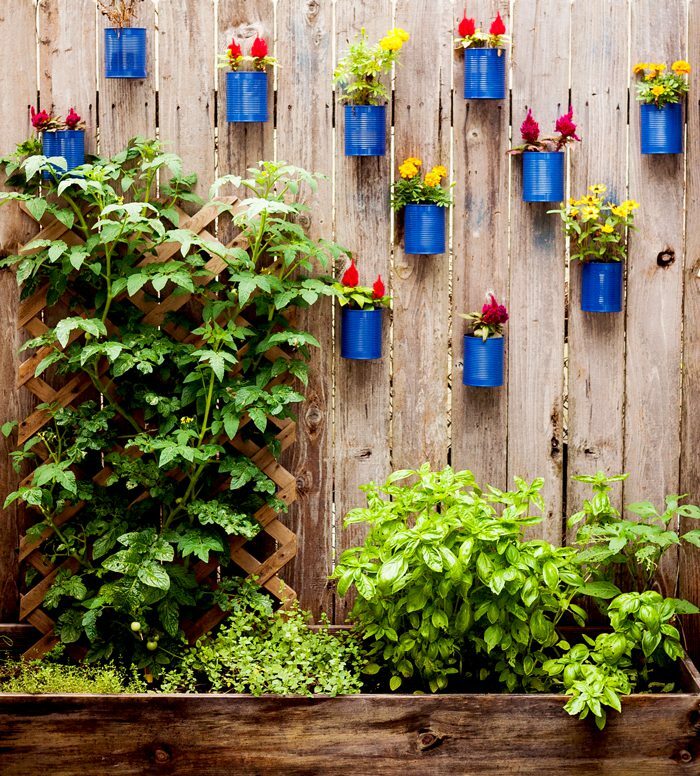 With a coat of blue spray paint and some nail holes in the bottom for drainage, the cans were transformed into cheery bursts of color and the perfect vessel to plant herbs and flowers. Pick a paint color that works well your yard: Pinks and purples complement a Moroccan-style backyard, and black and white look great with a minimalist theme. Just make sure to choose plants that aren’t too thirsty.